If you're a fan of golf... or not, I think you will enjoy this wonderful story of Byron Nelson. 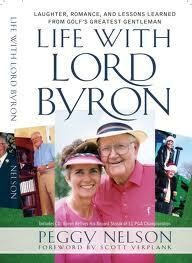 "Life with Lord Byron" is written by his second wife, Peggy Nelson. Peggy shares so much about the person that Byron Nelson was, it makes you feel as if you know him as well. From their first meeting to their wedding, from life on the ranch to traveling on golf tours, Peggy gives us a glimpse of this sports hero at his best. And it is not dissappointing. Byron Nelson was not just an amazing golf pro. He was a great friend. A loving husband. Many who knew him share their stories of how he touched their lives. And the stories, which are many, are all consistent. They show a man who had great talent, yet remained humble. A man who was a well known celebrity yet lived his life like an ordinary Joe. Kind, caring, compassionate, giving... and he loved people. I loved this book. Everything about it. The way Peggy told it made me feel like I was a part of the story. And like I wanted to be in the story. I love this great man of golf. He was a caring and gentle soul. True. Authentic. He not only shared his faith but he lived it. He didn't have to stand on a pulpit and preach... his life spoke volumes to those he came to know and love. He is someone I would have loved to meet. *I received this book from Kathy Carlton Willis Communications in exchange for my honest review. You can check out their website at www.kathycarltonwillis.com.